Racing fans around the world love to keep up with their favorite drivers behind the wheel. Fans also enjoy taking a glance at the upcoming schedule to see what tracks will be the next to test their favorite driver. The Formula 1 Schedule and Standings template contains all the information relevant to a particular racing season. There are several tabs like the team and driver standings or race results, as well as facts about the drivers, teams, season points and cars. Why Download the Formula 1 Schedule and Standings Microsoft Excel Template? So why should you consider downloading the Microsoft Formula 1 schedule and standings Microsoft Excel template? Having the complete schedule and standings for the Formula 1 season at your fingertips 24 hours a day is great for any fan to have. It is a way to see how well the drivers and cars performed throughout the season and the results can be compared to those of the following years. Quite simply, there are few better, if any, ways to keep track of what’s happening on the track than by using this incredible template. Still not convinced? Well, it’s important to note that this template is completely complimentary. That’s right, you won’t pay a cent to have the tools to follow the Formula 1 racing season the way a fan truly should. 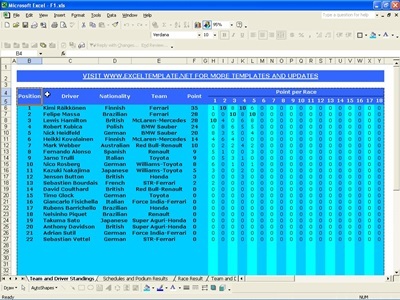 The Formula 1 schedule and standings Excel template can also be downloaded instantly. With a simple click of the mouse, you will have all that was outlined above at your immediate disposal. Furthermore, for those who need to perform additional research, the completed and totally customizable Excel template exclusively designed for Formula 1 provides a simple overview that can be used as a reference at any time. So feel free to download the free Formula 1 schedule and standings template today!